Are you looking for a better night sleep in the great state of Louisiana? Let’s face it, getting a good night’s sleep is essential, and purchasing a mattress is one key element to help you get there. That being said we understand that purchasing a mattress can be daunting. We looked through mattress stores across the state of Louisiana that offered high quality products, a customer service team that was friendly, patient and knowledgeable and we also scoped out locations that made delivery easy and offered fair return policies. From there we divided our review by some of the most populous regions in the state of Louisiana. That being said, the mattress industry has skyrocketed. Those living in remote areas who once had to drive for hours to shop for a mattress can now find something much close to home. In addition to mattress shops in New Orleans, Baton Rouge, and Shreveport, it is also possible to find quality mattress shops in smaller location too like Lafayette, Lake Charles, Houma, Mandeville, and Alexandria. Here are the best mattress stores in Louisiana. Have you ever wondered: Where can I find a mattress in New Orleans? We have the answer. We examined the highest-ranked mattress shops across the city and selected locations that carried a wide selection of quality mattresses, had great customer service, a range of prices, and convenient delivery options. Here’s what we came up with. Mattress Firm New Orleans (5300 Tchoupitoulas St.) offers a wide-range of mattresses, and great customer service. The sales team works to ensure that you find a mattress within your price range, and as always with Mattress Firm- there is a 120 day money-back guarantee. Other Mattress Firm locations we recommend are Mattress Firm City Park (533 N. Carrollton), Mattress Firm Metairie (3020 Veterans Memorial Blvd.) and Mattress Firm Algiers Plaza (4100 General Degaulle Dr.). Bedding Plus – New Orleans (2801 Magazine St.) is a great place to stop if you are looking for a high quality mattress. The sales team is extremely knowledgeable about their products and will not pressure you to purchase a mattress outside of your price range. This mattress shop carried foam hybrids and other higher-tech mattresses that may not be found in every mattress store in the city. To top it off, delivery is free. A long-standing staple in New Orleans is Doerr Furniture located in the Marigny (914 Elysian Fields Ave.). This is a great place to shop if you are looking to purchase a quality mattress and furnish other areas of your home-we love the convenience. This mattress and furniture store is where to head if you are looking for a no-pressure and casual shopping experience. This is a locally-run family-owned business. If you are looking for a mattress store in Baton Rouge, you have a lot to choose from. To help you narrow down your selection we surveyed the top-ranked mattress shops and only selected stores that had quality products, great customer service, and met the demands of their shoppers. Here’s what we found. Olinde’s Mattress Superstore (4201 Perkins Rd) is a locally-operated business established in 1886. The sales team is highly knowledgeable and works to ensure that you find a mattress to fit you and your budget. BR Furniture Outlet (7122 Florida Blvd) is a great place to head when you need a mattress and more. This family-run business opened in 2010 and sells mattresses and furniture at competitive prices. Here’s a quote from the owner: “As a victim of the great August flood of 2016, I know first hand how hard it is for families to start over and that’s why I will always have a fair low price guarantee for as long as our doors remain open.” American Freight Furniture and Mattress (8560 Florida Blvd.) is a locally operated mattress and furniture store that sells quality products in Baton Rouge and Metairie. We selected this shop for the high quality products and great customer service. This location offers same day delivery! Whether you are looking to upgrade your mattress, or are a first-time mattress buyer, purchasing a mattress can be tricky. To help you alleviate choice fatigue and to help you avoid sneaking sales representatives, we selected only the highest-ranked mattress stores with the best practices for customer service. We found that generally people like to shop without being pressured, with a knowledgeable staff who respected their budget. Convenience and fast delivery are also top priorities as are seamless return policies. Here are some of the best mattress stores in Shreveport. Mattress Center USA (1549 E. 70th St.) is family owned and operated. This mattress shop offers a wide selection, affordable prices, high quality customer service, and an overall great delivery experience. Mattress Firm Clearance (1630 E. 70th St.) is a good option for any individual looking to purchase an affordable mattress and quickly. This is a good fit for students and professionals alike. Sleep Number (7142 Youree Dr. Unit A) is an adjustable customizable bed. We like this location for individuals experiencing sleep disorders, chronic pain or just for anyone who is looking to sleep better and deeper. This caring sales team will not try to oversell you, and the selection is wide enough so that there is something for everyone. If you are looking to purchase a mattress in Lafayette, you’re in luck! Though there are a number of mattress shops in Lafayette, not all offer the best customer service and product. We found a few mattress stores that thankfully pulled through. Let’s take a look. WCC Furniture (255 Ridge Road) checks all of our boxes. Here you will find a no-pressure non-commissioned sales team who simply understand their products and are looking to help you. The products are high quality and affordable and the sales teams are courteous and efficient. Home Furniture Plus Bedding (5700 Johnston St. Suite 300) is a family-owned business established in 1945. The staff are friendly and patient and the quality of products surpass those of the competition. You will leave feeling like you’re part of the family. Sleep Number (4231 Ambassador Caffery Parkway) is a great place to head if you suffer from adverse sleep conditions like sleep apnea, chronic pain, and general insomnia. This is the perfect spot for couples as each side of the bed can be modified to match individual’s sleeping needs. The staff are knowledgeable and patient. Sleep Number beds have something called SleepIQ technology to help track and optimize sleep. Of course you don’t have to live in one of the larger metros of Louisiana to enjoy access to quality mattress shops. 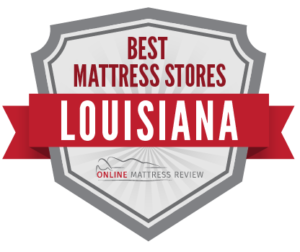 In or around the cities of Lake Charles, Alexandria, Slidell, Houma, Hammond, Bossier City, Mandeville, Ruston, Kenner, and Gonzolas there are many quality Louisianian mattress stores.